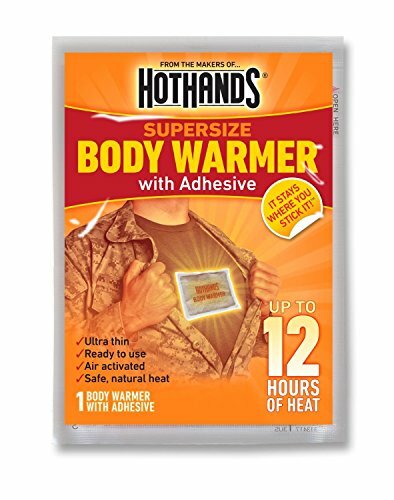 HotHands Adhesive Body Warmer 80-Pack This is 80 individually wrapped HotHands Adhesive Body Warmers. This is 80 individually wrapped HotHands Adhesive Body Warmers. Single use, air- activated heat packs that provide everyday warmth and are ideal for keeping your body warm when the temperature gets cold. These warmers provide safe, natural heat, so you can enjoy the great outdoors during those harsh winter months. The adhesive body warmers are great for maintaining core body temperature and can be used in many locations on the body. HotHands warmers are great for any occasion where long- lasting heat is desired: outdoor sports; hunting & fishing; tailgating at events; working in the yard; jogging or taking the pet for a walk; shopping or commuting to work. Features: - Ultra thin - Ready to use - Air- activated - Safe, natural heat - Adhesive - It stays where you stick it! - Odorless - No pockets required - Helps maintain core body temperature, promoting total body comfort - Each warmer provides up to 12 hours of heat Simply open the package, peel away the paper backing, and stick the warmers to your clothing. Warmer works best when placed between layers of clothing. Adhesive Backing so they Stay Where You Put Them!